Every building in our part of the world needs a reliable heating and air conditioning system to function. Summer is just too hot and humid to go without reliable air conditioning, making it as much of a necessity as your electricity and plumbing. That applies to commercial space such as offices and retail stores as well as homes. And it should: we spend most of our daytime hours in such spaces, after all, and we need to stay just as comfortable when we work, go shopping, or study our lessons. Because of that, commercial HVAC systems tend to differ a great deal from residential systems, despite operating according to the same basic principles. That’s one of the reasons why you should always trust a qualified commercial HVAC service to handle your system, instead of a primarily residential service attempting to “transpose.” How do commercial HVAC systems differ from residential systems? The specifics vary, but the general reasons are as follows. The first and most obvious difference between commercial and residential spaces is that commercial spaces are usually much larger than even the biggest home. Not only does that require much greater cooling power, but that cooling power must be tailored to the specifics of such a larger space. For example, an office building may rise 10 or 15 stories — much higher than any residence — and since heat rises, the upper stories need to be able to account for higher temperatures than the lower stories. Depending on the nature of the business, a commercial HVAC system may have very specific needs that supersede anything a residential building may require. For example, stored products such as foodstuffs may need to be kept at a certain temperature. Computers, too, are a major concern, especially if your business has a large number of them. You need to prevent them from overheating, and that means a steady and specific type of air conditioning system. With a residence, the HVAC system that works for one family will likely work just as well for any family occupying the space (though obviously, a few exceptions exist). Businesses vary much more widely, however, and an HVAC system built with one specific type of business in mind might have real trouble if a different business occupies the same space. 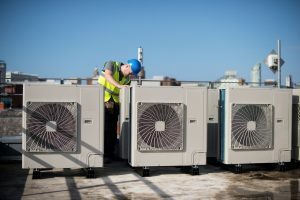 Accordingly, many commercial spaces use modular HVAC systems, which can have new units added and subtracted easily without replacing the entire system. That way, a new business can add or subtract cooling power as needed with just a few alterations. And since commercial spaces often have flap rooftops, there’s usually plenty of space to simply add a new modular unit to the system. For commercial HVAC services in Boerne, TX, call D’Spain Sales & Service, Inc. today! What’s the Difference between Commercial and Residential HVAC?